So my first Adepticon has come and gone! And it was simply amazing. People who were there know what I mean - the congratulatory and thankful facebook posts have been rolling through my page filled with tags for seemingly half my friends list, and dozens of people have asked to become my new FB friend. It was an epic community building event. That aside, I was in a rather unique position as I was asked to help judge the Crystal Brush painting competition. This was an incredible honor (and one I sincerely hope to repeat some day) and also a duty that I took very seriously. I will admit I was rather nervous having to be hyper critical and to give not only my opinion to the other judges (the amazing duo of Angel Giraldez of Luxumbra/Studio Giraldez/Corvis Belli and Jose Nunez Palomares of Big Child Creatives) but also constructive feedback to my peers, many of whom I have known for years. In my opinion, it is sometimes harder to be vigilant and critical with friends than with strangers - and this event was full of friends and artist who I have admired for years. As a lifelong student of the Arts and an art teacher for the last 17 years, however, critique is simply part of the job and understood as a neccesity for growth. I know that there are those who I lean on for important constructive feedback. Dragomir Milanovic whose work I have featured here on several occasions is one such friend that I rely heavily on, and without David Diamondstone's acute critical eye I don't know that I would have been able to push my Boromir bust past the Silver level it attained at GenCon to the Gold it earned in Sword and Brush. So I judged by the spirit and the letter of the competition. It was exhilarating. Moreso than that it went incredibly smoothly! I couldn't have asked for a better team. Our scores were very uniformly close and showed that we all shared a keen understanding of not only what we were looking at but how we would rank them. When there was divergence we discussed, but in the end we each scored within a point of another judge on every entry. It was clean and definitive and then handed on to the community to complete the scoring by voting through the website on the incredible photos prepared through the massive efforts of Jennifer Haley. I am proud of our work and I stand by it. 1. 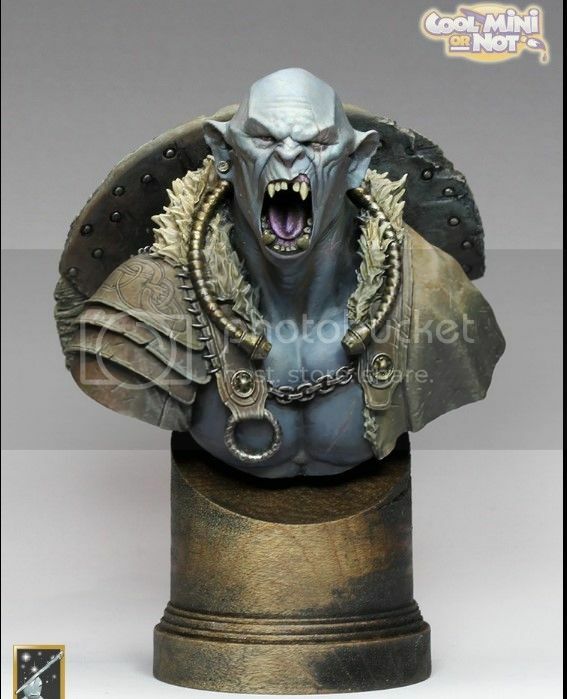 David Diamondstone - The White Orc. You probably did see this one as it was one of the ones in the running but I decided to include it anyway. One of my favorite pieces in the show and one that I used as an example in discussions throughout the weekend. this piece was a legitimate contender in a stacked category. I have seen and enjoyed this sculpt on the internet many times but this is by far my favorite iteration. The textures in the leather are incredible, the sense of light is subtle and beautiful and the design on the shield is immaculate in its execution. The variety of surfaces depicted is so convincing. I love this piece and will remember it for years to come. 3. 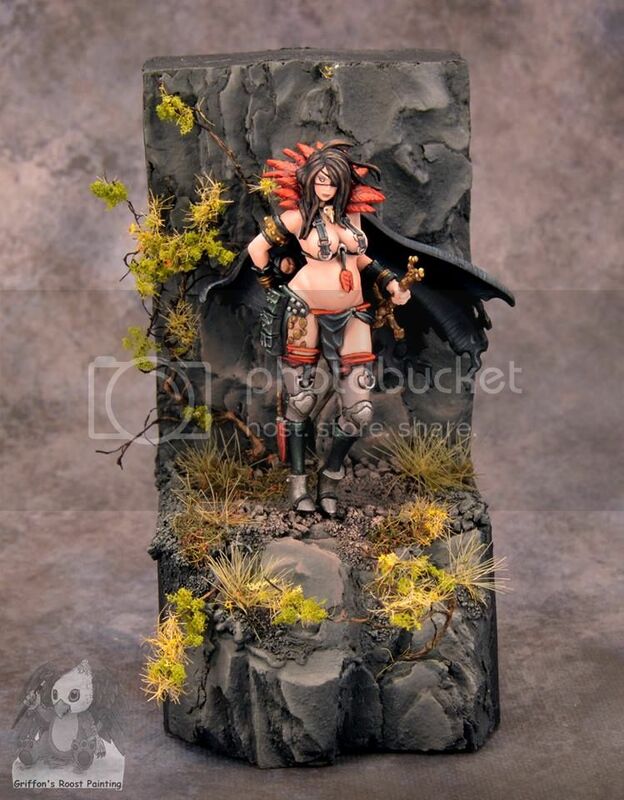 Lauren Fahey (Griffons Roost Painting) - Fade (Kingdom Death) This was a really lovely piece that had beautiful skin tones, solid composition (great use of the vegetation to move the eye around and an interesting way to break up the traditional plinth to create greater interest and movement) and some really great details throughout. Plus the artist was super nice. 4. Cygnar Stormwall - While the finish on it was a dusty drybrushed type of surface that was difficult to take great photos of - the overall impression of this model was excellent. The colour combinations were really cool and the overall level of detail was really great. 5. Monk - mini diorama by Michael Stubbs - Michael again on this list - not because I have known him for years or because I thoroughly enjoy his sense of humor, but rather because his understanding of the "rule of cool" always shines through in his work. He gave a great deal of thought to the overall presentation of this little vignette and the extra details - like the porcelain planters with individual blue glazework designs and the beautiful little koi - are simply cool. I really enjoyed seeing this. 6. Alien Queen - a simple but incredibly effective piece with a HIGH "cool factor". The scene told a clear story and the whole thing was painted very clean. I desperately wish I had a better picture of this! If anyone out there does - I would love to replace this one as it does the little scene zero justice! 8. Mordacius Tranquility by Seth Amsden (a different Seth than above!) - the application of painting technique may have been a little oversimplified here but the overall impression was fantastic! I LOVED the composition, the way the natural elements framed the scene and the energy of the rabbit jumping forward - a Kingdom death meets Alice in Wonderland moment to be sure. the sense of dramatic lighting was clever and the whole thing was really really pleasing. Genuinely loved this piece. Unfortunately there are a few that I really liked that I do not have proper phots of - including Russo's Darth Maul and Mecha entries - But with that being said I do have a few more nice shots to share so I will leave a link for a slide show of some of my shots from across the event here - hope you enjoy as much as I have! Thank you so much for the kind words. I really had fun making these as well as seeing so many friends! Those guys are in a different zip code in quality than when I last competed in a paint competition. I am planning to return in some form next year. Where in the world does that Zelda miniature come from?! PPC! glad to hear it bud - lmk if you want to bounce ideas!